As a Creative Director who's spent the last ten years working on web sites and digital ideas, you sometimes get the feel that creativity has been supplanted by technology, and that may of the awards shows only reward flashy, spinny, trippy web 3.0 widgety things. 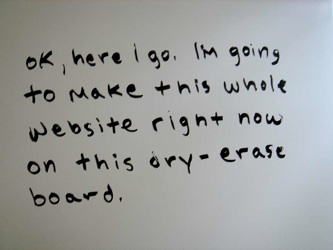 The site by Miranda July to promote her new book is exactly the opposite, low tech, simple and extremely imaginative. If she thinks like this, I REALLY want to go buy the book. VERY cool! The creativity there just floors me. said Andertoons on April 11, 2007 3:33 PM. said HelloWorld on April 29, 2007 3:51 AM.